We’re easy to find. Just follow the great aroma of pizza! Or, if you need it… use our map. 33rd St. & Pacific Ave. Between Pacific Ave. & Arctic Ave. The Pizza is DELICIOUS! We come from an area of many wonderful pizzerias & wing places, so we can be hard to please BUT we were so surprised. The Cheese was the best part for me, a rich & full flavor. My husband said “I’m sorry we’re not staying another day, just so we could come back.” Our waitress, Chelsea B., was attentive & enthusiastic. – Good job Chelsea! I wanted to take a minute to thank you and your entire staff for a wonderful eating adventure. All of our students loved the food and my administrative staff loved the catered food. I couldn’t have asked for a better response to our needs. I want to say personally, that you are the best at what you do. I look forward to contacting you again on our next trip down. Additionally, one of the best parts to this was seeing your restaurant completely full while other restaurants on Atlantic were empty. I even heard one family walking down Atlantic say “that place is crowded, it must be real good lets go in there,” and sure enough they walked in and sat down. Thanks again for all you did. 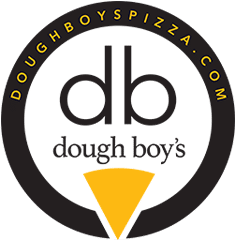 This summer me and family visited a Dough Boy's Pizza at 17th street and Atlantic Ave, and I must say it was without a doubt the best pizza I ever had. The service was perfect and I would go there once a week if you had one in my home town in West Virginia. I look forward to eating at your pizzeria next year.